Temple groups "deeply worried" by Ramadan closure, join in call for arrangement like the one at Cave of Patriarchs. Calls to create a partition between two sections of the Temple Mount, one for Jewish use and the other for Muslims, are gaining momentum, as police prepare to close off the Mount to Jews for five straight days. The Israel Police intend to deny Jews entry to the Mount from the coming Friday until next Tuesday, supposedly because Muslims are holding celebrations there marking the end of the Ramadan month. The Temple organizations expressed "deep concern" over the decision, which they say could lead to damage to the Mount's sanctity. "Aside from the disconnection from the Mount and the stoppage of Jewish prayers there, we cannot help but wonder again about the police's hostile attitude to the Jewish bond to the Temple Mount," a statement from the organizations said. 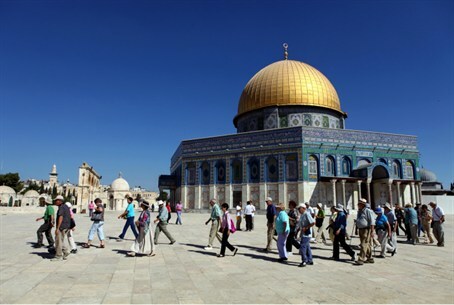 The groups noted that in past years, the Muslim Waqf trust and the Islamic Movement took advantage of similar periods of time, in which the Mount was open to Muslims only, to carry out "irreversible piratical and illegal activity." The construction in Solomon's Stables and the digs carried out at the location of the Temple itself – which caused destruction of Temple artifacts – have always been carried out during Ramadan, they charged. It is unacceptable that the Jews always wind up with the short end of the stick, the Temple organizations argued: They are kept from entering during Muslim feasts, and are similarly barred during Jewish holidays. Three weeks ago, they note, Jews were forbidden from entering during the Ninth of Av – in which Jews mourn the destruction of the First and Second Temples. The groups joined in a call to adopt an arrangement similar to the one in force at the Cave of Machpela in Hevron, where part of the site is used by Muslims and another by Jews. Jews have exclusive use of the Cave on Jewish holidays, and Muslims enjoy exclusivity on Muslim holidays. The idea has broad support among religious-Zionist Knesset Members. Coalition Chairman Zev Elkin (Likud) has said he supports regulating access to the Mount in this fashion, as has Jewish Home head Minister Daniel Hershkowitz. MK Aryeh Eldad (National Union) has submitted a bill to this effect, and MK Otniel Schneller (Kadima) said a bill is unnecessary, and a government decision would suffice.